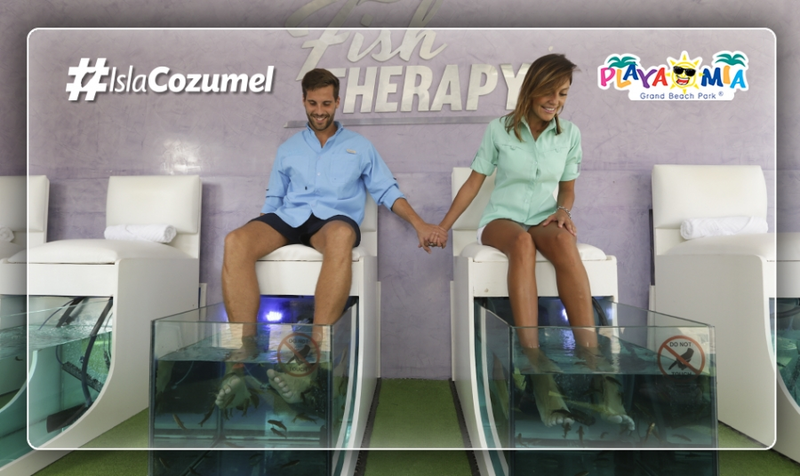 Fish Spa Magic at Playa Mia: Relax & Let the “Doctor Fish” Work! Do you like to try new experiences when you travel? New foods, new music, and new ways of relaxing? Then don’t miss out on a special massage treatment at Playa Mia’s fish spa. Officially known as Ictiotherapy, our fish spa provides one of the planet’s most unique wellness treatments. Sit back, put your feet in a pool of water, and let tiny little fish nibble on your feet. Does it sound crazy? Read on to see why Ictiotherapy really works! What is Ictiotherapy – and How Does a Fish Spa Work? Our fish spa polishes your feet and toes with the help of Garra Rufa fish, tiny creatures known as the “Doctor Fish.” They nibble on your feet and remove dead skin cells, which improves blood circulation and also cleans your pores. It’s a real sensation, but it doesn’t hurt at all – just a little weird. Our unique fish spa treatment service takes just 15 minutes to pamper your feet and costs $25 per session. It’s one of the cool add-on activities that we offer to enhance your Cozumel vacation at Playa Mia Grand Beach Park. You can also add on parasailing, snorkel tours, snorkel gear rentals, wave runner rentals, and photo packages! Savor every moment of your island getaway. Want to know more about our fish spa and other great add-on attractions? Contact Playa Mia today!